ECB monetary policy decision and Markit PMIs to take center stage this week. EUR/USD bearish potential increased for the upcoming week, 1.1215 exposed. The EUR/USD pair aims to close the week at fresh 2-week lows in the 1.1360 price zone, mostly led by EUR's self-weakness. The common currency took a dive after a German report showed that the country's growth was the slowest in 5 years in 2018, just 1.5% up. The report was followed by ECB's Draghi testimony, which included cautious and dovish words about future growth and inflation. When addressing the EU Parliament, the head of the European Central Bank said that despite the ongoing economic weakness, the Union is not headed for a recession. Anyway, he added that policymakers have, and will use the tools needed in such a scenario. Weaker-than-expected growth, however, has affected odds for an ECB rate hike this year. Inflation data added to such speculation, as the EU final version of December inflation was confirmed at 1.6% YoY, below November's reading of 1.9%. The fact that there are neither reasons to buy the greenback, kept the pair trading choppily after the EU bad news were priced in. The little US data published was generally encouraging, but no shockers that can trigger directional moves. The usual caveats, named the US-China trade war, fears of slowing economic growth, the government shutdown, and Brexit no-progress, will probably keep the mood down in the upcoming days. US equities bared quite well with risk-factors, getting an expected boost these last few days from better-than-expected banks' earnings reports, and rising crude oil prices, which underpinned the energy sector. Guessing US President Trump is not concerned about the shutdown as long as Wall Street keeps rallying. Next week calendar will include the ZEW survey on economic sentiment, both for Germany and the EU, and the preliminary Markit PMIs for the EU and the US. The ECB will have its monetary policy meeting next Thursday but seems unlikely Draghi & Co. could surprise market players. 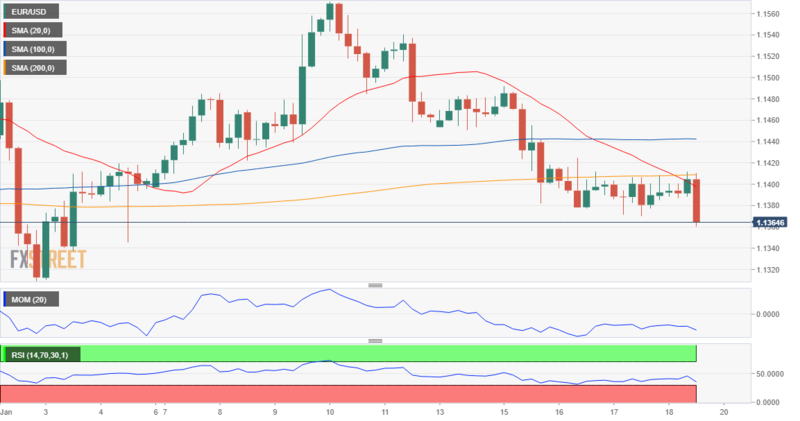 The EUR/USD pair fell Friday for a fourth consecutive day, ending the week at its lowest since early January, and more relevant, below the 61.8% retracement of its latest daily bullish run at around 1.1380, which opens doors for a steeper decline in the upcoming days. The weekly chart shows that a bearish 20 SMA once again contained bulls, while the 200 SMA continues lacking directional strength below the current level. Technical indicators retreat from their midlines, maintaining downward slopes although without directional strength, anyway keeping the risk skewed to the upside. In the daily chart, the bearish potential is even clearer given that the pair is developing below all of its moving averages, while technical indicators extended their declines to fresh monthly lows within negative levels. The decline could gain downward momentum if the pair extends its decline below 1.1310, the immediate support, with the next one being 1.1215 a relevant low of 2018. A better EUR performance could come on a break above 1.1460 a relevant resistance ahead of 1.1520. The FXStreet Forecast Poll shows that speculative interest expects a downward extension for this week, with bears accounting for 41% of the polled experts and an average target of 1.1385. Bulls take over in the 1 and 3 months views, with the pair seen then barely above the 1.1400 figure. All of this suggests that demand for the greenback remains subdued amid an unclear picture of the future US monetary policy. In the Overview chart, the shorter moving average, that reflects what's expected for next week, turned bearish, although within familiar, with the spread of possible targets evenly distributed. Moving averages lose directional strength as time goes by, and in the 3-month perspective, a large accumulation of possible targets comes between 1.16 and 1.18.